JEFFERSON CITY, Mo. 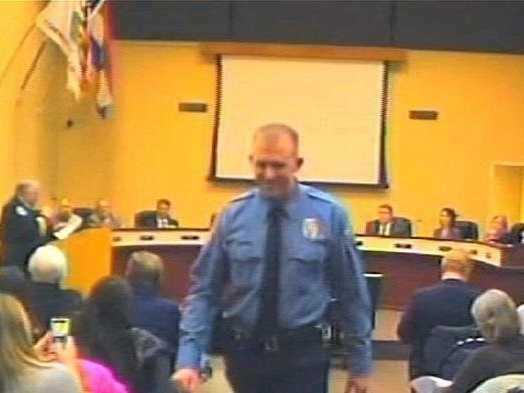 (AP) — Darren Wilson, the Ferguson police officer who fatally shot an unarmed black teenager in August, is in talks with officials to resign, CNN reports. The negotiations come at the same time that a grand jury, which has been investigating the case for several months, is expected to decide whether or not to indict him. Wilson seems confident that he will not face criminal charges from a grand jury, a police union official said Thursday. Meanwhile, The Washington Post reports that Ferguson Police Chief Thomas Jackson said on Thursday that Wilson is unlikely to return to his job regardless of whether a grand jury decides to indict him. Wilson has been on paid administrative leave since the shooting. Jeff Roorda, business manager for the St. Louis Police Officers’ Association, said he met Thursday with the St. Louis police officer, who has remained secluded from the public eye since the Aug. 9 shooting of 18-year-old Michael Brown that sparked tense and occasionally violent protests and drew national attention. Wilson has been under a lot of pressure and stress but appeared confident in the outcome of the grand jury investigation, Roorda said. “It’s fair to say that neither he nor his defence team expect an indictment,” Roorda said, offering his impression of the situation based on the meeting with Wilson. Roorda later told the AP in a text message that he was only speaking for himself. “Wilson seems confident that justice will be served, but neither he nor his attorneys shared any expectations with me,” he said in the text. One of Wilson’s attorneys, who also attended Thursday’s meeting, said there was no specific discussion of expectations. If he is indicted, Wilson will immediately turn himself in to authorities, Bruntrager said. A 12-person St. Louis County grand jury has been hearing evidence in the case as it weighs whether to issue charges against the white officer for the black 18-year-old’s death. A decision could come soon, though authorities have not publicized any specific date for an announcement. Roorda said St. Louis city police have been notified that they are switching to 12-hour shifts starting Saturday, a preparation for a potential uptick in protests. The St. Louis County Police Department has not yet decided whether to switch to longer work shifts, spokesman Brian Schellman said. For weeks, local and state police have been preparing for a grand jury announcement in anticipation that it will result in renewed protests. Earlier this week, Gov. Jay Nixon declared a state of emergency and activated the National Guard to help with security. Authorities have said Wilson shot Brown, who was unarmed, following some sort of physical confrontation that occurred after Wilson told Brown and a friend to stop walking down the center of a street. Wilson told authorities that the shooting happened after Brown struggled with him for his gun, according to reports by the St. Louis Post-Dispatch and the New York Times that cited unnamed sources. But some witnesses have said Brown had his arms raised — as if to surrender — when the fatal shot was fired. Riots and looting occurred a day after the shooting, and protesters filled the streets for weeks. Police responded by firing tear gas and smoke canisters into crowds of demonstrators after some people threw rocks and Molotov cocktails. Protests have been nearly constant since the shooting. The vast majority of protesters want to see the officer charged with murder. Many are also pushing for changes in the way police and the courts interact with minorities. A handful of demonstrations have been in support of Wilson. Crump said he had no insight into the timing of the grand jury’s decision, but that he expected to be notified ahead of any public announcement. Wilson has incurred significant legal, medical and relocation expenses, and a police charity has raised close to $US500,000 for him, Roorda said. Associated Press writers Jim Salter in St. Louis and Eric Tucker in Washington contributed to this report.